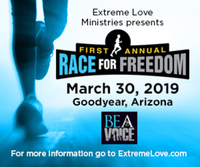 Join us for our first annual Race for Freedom fundraising and awareness event, where your steps will bring freedom to individuals, situations, cities, and nations. On this beautiful Sonoran trail you can run, walk or hike a Half Marathon, 5K, Fun Run or Virtual route and location of your choosing. Onsite, we will have community partners, vendors, food, and fun for the whole family. You don’t want to miss this!